As an obese 30 year old, I used running and diet to dramatically reduce my body fat. Soon thereafter, my body adapted and I started lifting weights in order to limit my body fat. Following the “traditional” fitness regimen of strength conditioning and cardio I hit a training plateau, which led me to CrossFit. Upon discovering CrossFit at the age of 40, my eyes were truly opened to the world of fitness. 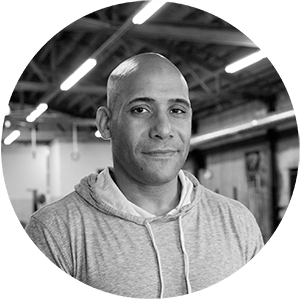 Understanding the sense of empowerment that people feel when they are able to accomplish their athletic, fitness, and health goals, lead me to obtain his CrossFit Level-1 Trainer Certification and participate in the establishment of Phenomenal CrossFit. Before I started CrossFit, I’d work out twice a day, 4-5 days a week at a local gym (following the traditional recipe of45-60 minutes of strength work combined with extended cardio sessions). I thought I was fit, but upon completing the base line WOD, I realized I was not nearly as fit as I thought I was. After nearly two years of CrossFitting, I realize I was wasting my time on an inefficient regimen and not pushing myself nearly as hard as I thought I was. I cannot imagine going back to the same old gym routine. Now, I am constantly looking for self-improvement. That may come in the form of lifting more, increasing endurance or becoming leaner. Most times, I striving for all three! The competition that CrossFit introduces into the fitness regimen cannot be understated with respect to its impact on intensity and community building. Both of which are hallmarks of CrossFit.